Once you have pavers installed, regular maintenance is still required if you want them to remain in good condition all year long. Weather and humidity can be harsh in Florida and cleaning, repair, and minor fixes are necessary from time to time in order for your pavers to retaining their initial beauty and age gracefully. We offer pressure cleaning, seal coating, and everything in between with one goal in mind: helping you save money by extending the life of your pavers by using the best maintenance tools and procedures. It will improve the safety of you and your loved ones while also reviving the colors and the inherent beauty of your pavers. And you know what is the best thing about this: it only takes a few hours every now and then! Whether you are looking for paver sealing or paver maintenance and cleaning, we can help. We have seen it all and have experience dealing with all kinds of situations. 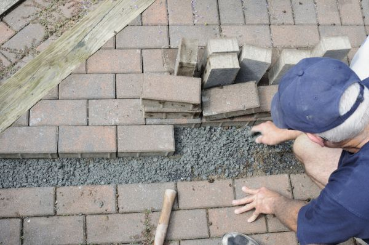 We can repair your sinking pavers if the land has been poorly prepared. We can fill the space with sand and pressure wash mildew or plant growth, something that turns up very often around the pool area. Once the repair is done, it is highly recommended to seal the pavers to protect them from further damage. As you already know, once a paver has been damaged, you will see signs of cracking, crumbling, or chips. Just give us a call at the first sign of damage or any other issue, and we will come fast to the rescue. Our paver sealing services are among the best in the area. Commercial and residential pressure cleaning are both offered as part of our services. Maximizing your outdoor space is what pavers are great at, but without proper maintenance and care it would lose a lot of its luster. Our staff members receive continuous training and know how to repair, seal, and clean your pavers once they have been installed. An annual inspection is usually enough to repair damaged or chipped pavers and to replace them when required. We can use the exact same color and style of paver so that nobody will see the difference. Our team can take handle all kinds of brick, tile, concrete, and stone pavers. If you have noticed that they are fading in color, or have a dull appearance, we can assist you in making them shiny and colorful again. Sealing is probably the most important operation, and we like to perform it generally once a year beginning one to three months after installing the pavers. It makes them more stain-resistant and enhances the overall color and sheen. We put our customers first and offer efficient and reliable pavers maintenance solutions for everyone in the vicinity. We have maintained all varieties of pavers from value brand all the way up to the more notable high quality materials that we are used to installing. Call our office today at 321-280-9011 to learn more about out pavers services or to directly book an appointment with our paving experts.